Home > Blog > Allergies > Can Allergy Shots Help Bee Sting Allergies? Can Allergy Shots Help Bee Sting Allergies? Whether honey or bumble, bees are one of the five insects found in the US that can cause an allergic reaction when stung. The other four insects are wasps, yellow jackets, hornets and fire ants. Unfortunately, many do not know they are allergic to insect stings until they are stung and an allergic reaction occurs. While stings are a mild annoyance to some, 0.4% – 0.8% of children and 3% of adults have life-threatening allergic reactions to insect venom. Thankfully, people allergic to bee stings have an option. Venom immunotherapy is the closest thing to a cure and is 97% effective in preventing future allergic reactions. Patients will receive regular injections with small amounts of insect venom increasing in dosage over 3-5 years. This will desensitize them to the venom and build up an immunity to future stings. As the weather warms up and families spend more time outside, incidents of insect stings increase. People who have already experienced a systemic allergic reaction to an insect sting are at risk of a similar or worse reaction if they are stung again. It is recommended those who have experienced a systemic reaction carry an epinephrine auto-injector. Wear light-colored clothes instead of bright-colored clothing that can attract bees looking for flowers. 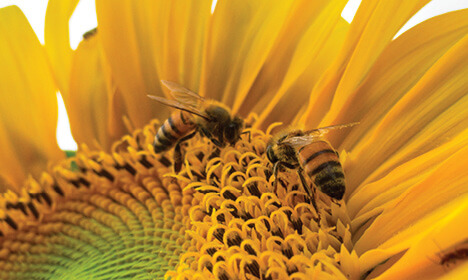 Avoid perfumed soaps, shampoos, deodorants, perfumes or cologne that can attract bees. Wear clothing to cover as much of the body as possible and avoid loose-fitting clothes that can trap insects. Be careful when eating sweets or drinking sugary beverages outside, wasps and bees are attracted to the sugar in foods and drinks. Do not swat at the bee if a single bee is flying around, remain calm and move away, swatting will only provoke the insect. If the insect gets in the car, slow to a stop and open all windows to allow the insect to fly away. What To Do If Stung? Normal local reaction – swelling, redness, and pain confined to sting site. Large local reaction – swelling beyond sting site, this swelling can last for a week or more. Systemic allergic reaction – potentially life-threatening, requires medical attention. Anaphylaxis symptoms are one or more of the following: hives, itchiness, flushing, swelling, dizziness or a sharp drop in blood pressure, swelling of the tongue, difficulty swallowing, abdominal cramping, vomiting, nausea, diarrhea, unconsciousness or cardiac arrest. For a small local reaction, wash the site with soap and water, remove the stinger, and apply ice to reduce swelling. A systemic allergic reaction requires medical attention; a dose of epinephrine may be required. A board-certified allergist can determine if you are allergic to bee or other insect venom and discuss the best course of action to prevent further allergic reactions. Schedule an appointment today! https://www.familyallergy.com/wp-content/uploads/2016/04/BeeStingAllergies.png 378 720 Family Allergy https://www.familyallergy.com/wp-content/uploads/2017/09/faa-logo.svg Family Allergy2016-04-21 21:28:062017-10-04 19:47:56Can Allergy Shots Help Bee Sting Allergies?